Boulder City’s Olivia Mikkelson reacts to winning her second consecutive singles state championship. The Class 3A Southern League’s tennis players took over the state tournament at Tahoe Donner Tennis Center, sweeping the finals matches in the team and individual brackets. Squads and players from Boulder City, The Meadows, and Western High School were left standing after three days of competition between the state’s top tennis players. 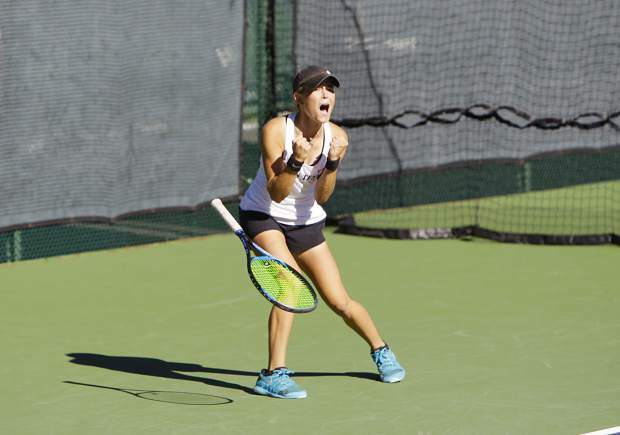 The finals of the girls’ singles tournament, on Saturday, Oct. 20, highlighted the championships as The Meadows’ Lindsey Hofflander took on reigning champion, Olivia Mikkelson, of Boulder City. After dropping the first set, 6-4, Mikkelson bounced back with a 6-1 victory in the next to force a tiebreaker. Throughout the final frame, Mikkelson would ride a roller coaster of emotions — juxtaposing times of burying her head in a towel with others of triumphant fist pumps. Eventually, the defending champion would break Hofflander’s serve to take a 6-5 lead, and ultimately, another state championship. For the past two years the Class 3A singles state championships have been dominated by two players — Truckee’s Zach Haas and Western’s Rua Elmore. Haas entered this year’s tournament as the two-time defending state champion, having defeated Elmore in each of the past two finals. The Truckee senior also came in as the four-time Northern League champion, and in search of a record-tying third singles state title. After faltering in the Southern League playoffs, Elmore, a junior, came into the tournament as the No. 2 seed, eventually leading to a matchup with Haas in the semifinals. After a 6-2 defeat in the first set, Elmore bounced back to win the next two sets, ending the reign of one of the best singles players in Nevada history. Elmore would go on to capture his first state championship, defeating Boulder City’s Connor Mikkelson, 6-3, 6-4. “All the work the coach has put in and the work that I’ve put in, has finally paid off,” said Elmore on winning this year’s title. Haas finished in third place, taking a 6-4, 6-2 win against Moapa Valley’s Chase Hadley. The boys and girls’ state doubles tournament featured battles between teams from Boulder City and The Meadows. On the boys’ side, Boulder City’s Boen Huxford and Preston Jorgensen took a 6-2, 6-0 win against teammates Ty Pendleton and Karsen Bailey to capture this year’s title. Truckee’s defending state champions, Zach Larson and Noah Warren, were knocked out in the first round, along with teammates, Turner Drummond and Elliot Rost. On the girls’ side, The Meadows, Grace Nemec and Peyton Barsel topped teammates Allison Stone and Nishele Phansalkar-Michalik in the finals, 6-0, 6-2. In team play, the Boulder City boys took the title, defeating The Meadows 10-2. The Wolverines came in as the top team from the Northern League, but fell in the semifinals to the Mustangs 9-9 (5-1). The Meadows took the team title on the girls’ side, winning 11-4 against Boulder City. The Lady Wolverines entered the tournament as the Northern League champions, but were knocked out in the opening round, falling 16-2 against the Eagles.